Less than two years after vowing to deliver on an "unprecedented partnership" with Nintendo, gaming giant EA is quiet on the Wii U front. "We have no games in development for the Wii U currently," company spokesperson Jeff Brown told Kotaku yesterday. He did not rule out the chances of EA developing for the Wii U again. EA publishes many of gaming's biggest franchises, including Madden, The Sims, and Battlefield. In June 2011, at the biggest gaming event of the year—E3—Nintendo CEO Satoru Iwata closed his presentation of his company's biggest games and then-forthcoming Wii U console by welcoming then-CEO of EA John Riccitiello to the stage. "What Nintendo's new console delivers speaks directly to the players of EA Sports and EA Games. Nintendo's new console will produce brilliant high-definition graphics and new gameplay opportunities. We look forward to seeing great EA content on this new platform." Riccitiello was also enthused about Nintendo's embrace of online gaming. EA delivered for Wii U early, releasing Wii U versions of Mass Effect 3, Need For Speed Most Wanted, Madden and FIFA for the new console. Each of those games had been released months earlier on rival Xbox 360 and PlayStation 3 platforms. While they ran well, they were, ultimately, late ports. EA's biggest console game of early 2013, Dead Space 3, skipped the Wii U. Brown told Kotaku that that early run of EA games on Wii U represented EA delivering on its E3 2011 partnership. EA supported Nintendo's previous console, the Wii, throughout the machine's lifespan, even launching some Wii-only/Wii-first games such as Steven Spielberg's Boom Blox and the MySims games. But the company, like many other major third-party companies, struggled to find a blockbuster hit for Wii. Rival Ubisoft succeeded with Just Dance, but that was an exception. On Nintendo consoles, traditionally the main company that has thrived is Nintendo as system owners flock to support the likes of the Wii Sports, Super Mario and Zelda games from Nintendo. 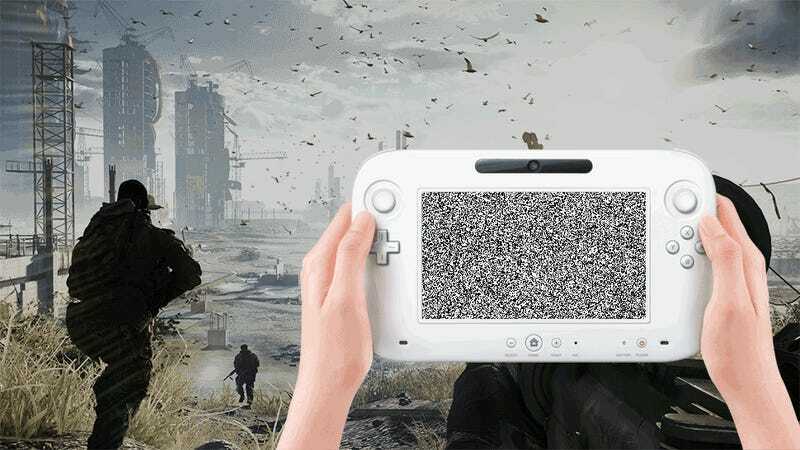 The full absence of Wii U games from Nintendo's pipeline seemed increasingly likely as the Wii U remained conspicuously absent from announcements regarding major 2013 EA games such as Battlefield 4 and the new Madden and FIFA. A lack of EA support will prevent Wii U gamers from having access to an NFL game, for which EA holds the exclusive license. EA's refusal to put its sports games on Sega's Dreamcast system in 1999 is seen as one of the signs of Sega's decline in as a console maker. The Dreamcast was Sega's last box. On the other hand, EA may not be the kingmaker it once was, and it could be argued that Nintendo's own Wii Sports is the most successful and broadly-appealing sports game of the last generation. While EA has clearly cooled on Wii U, it is ramping up support for many other devices, including the next PlayStation and Xbox, the latter of which will be officially revealed on May 21. "I’ve been with the company long time and we have never been better positioned for the launch of new technology, either mobile or console," Brown said. He said EA has invested deeply in preparing games for the next generation of consoles and expects to launch strong as it did at the start of the PS2 and Xbox era than it did with a weaker game slate at the beginning of the Xbox 360, PS3 and Wii generation. Much of that planning can be credited to Riccitiello, who departed from EA earlier this year. EA isn't alone in not having new games for Wii U. There are no signs of major forthcoming Wii U games from Take Two, with Grand Theft Auto V only promised for PS3 and Xbox 360. The next Call of Duty is also not announced for Wii U (the last one did come out for it). On the other hand, Warner Brothers has the next Batman game and the console-exclusive Scribblenauts Unmasked for Wii U this year. Ubisoft is bringing major Rayman and Assassin's Creed games to Wii U this year along with its ambitious new open-world game Watch Dogs.